Dutch Ned, whose real name — best anyone can figure — was Nils Jacob Ohmn, delivered mail on horseback from Seattle to Auburn in the 1880s. WHAT TO WRITE about Dutch Ned — or what to rewrite? 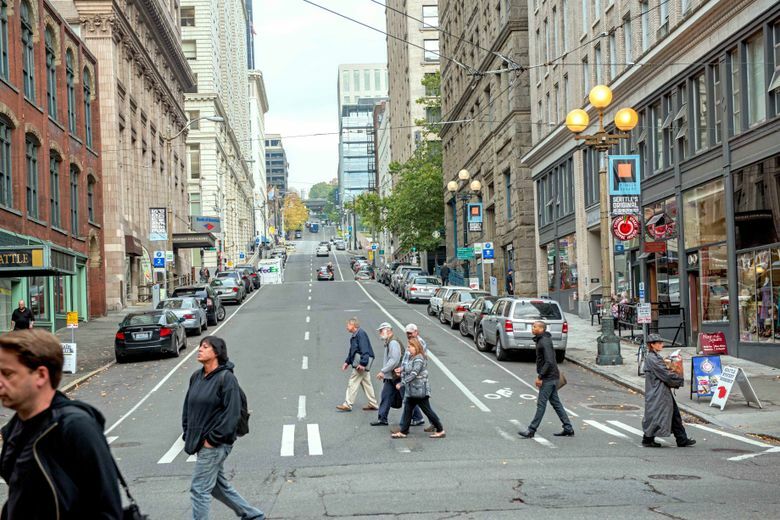 The several short accounts of this Seattle pioneer are constructed of a few tidbits told and retold. And his surname is confusing: Ohn, Olm, Ohm and Ohmn all appear in print. Nils Jacob Ohmn is chiseled on what remains of his tomb in Seattle’s Lake View Cemetery. His more often-used nickname, Dutch Ned, suggests one of Deutsch or German (not Dutch) descent. Or was he Italian? C.T. Conover, The Seattle Times’ longtime heritage reporter, noted in a July 1, 1957, offering of his “Just Cogitating” column that a correspondent, Mrs. M.T. Jensen, remembered “Uncle Ned Ohm, a Sicilian, who carried the mail weekly. He always stopped at my old home in Auburn (then Slaughter), where I was born in 1876. 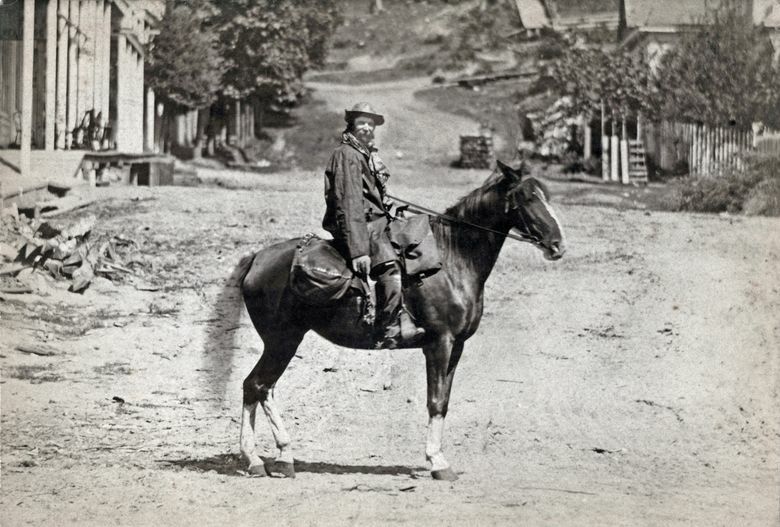 There he would feed and rest his horse … a lone old man in a new world, his only relative a sister in far-away Sicily, to whom he always sent a part of his scant earnings.” In this photograph, from about 1880, Nils, holding his mail pack, poses with his horse on Cherry Street. Dutch Ned’s weekly labor of delivering the mail on horseback between Seattle and Auburn was one of two full-time jobs ascribed to him. Born in 1820 (also on his tombstone), Ned reportedly arrived in Seattle in 1854 and soon landed the job of spreading sawdust from Henry Yesler’s sawmill to lift the pioneer village above its wetlands. Lucile McDonald, another of this newspaper’s most prolific history reporters, summed up the reclaiming half of “Nels Ohm” as “a familiar figure of the period, who was kept busy filling swampy places with mill waste.” McDonald’s March 15,1953, feature in Pacific NW’s predecessor, the Seattle Sunday Times Magazine, celebrated the 100th anniversary of the opening of Yesler’s mill. On the cover of the magazine section was one of Times staff artist Parker McAllister’s popular watercolors, a rendering of Yesler’s smoking mill. Dutch Ned and his packed “big red wheelbarrow” were part of the painting. Posthumous sketches of Dutch Ned often characterize him as “soft-brained” and “dimwitted.” Some of this probably stems from his tomb and denouement. Nils or Nels Ohmn lived in a shack on the western brow of Capitol Hill overlooking the south end of Lake Union. A few years before his death in 1898, he prepaid for his funeral and bought a burial site in Lake View Cemetery, near his home. There on Lot 470 he built his own mausoleum and, once it was completed, entertained friends in or beside what he called his “little house.” Stranger still, he often visited for long hours the lobby of Bonney-Watson, the funeral home he had paid to bury him. Check out Paul Dorpat and Jean Sherrard’s blog at pauldorpat.com.